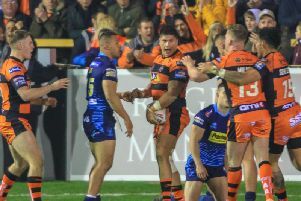 Where a similar comeback had narrowly failed to bring home the points for the Tigers at Leeds the previous week they came from 20-0 down to win 38-28 against last year’s Grand Final winners and Powell was exhausted, but delighted after the game. He said: “It was pretty similar to last week, scoreline-wise, at half-time and then the second half just looks completely different. “Perhaps we need to see how we can get a response from the warm-up to get us going in the first half similar to what we’re doing in the second! “I thought we were pretty good in the first half in lots of areas, but obviously our right edge got exposed a fair bit and it looked like the game was really going away from us. “We showed lot of character, toughness and resilience to get back in it and it was fitting that Tuoyo (Egodo), who’s had a pretty rough first half scored the winning try. When asked what he had said to the players at half-time, Powell added: “It was positive really. “Clearly we had to do something about our right edge and I thought they were much better in the second half. That was a positive message, it was given pretty sternly. Castleford were without seven first teamers for the game and lost another to injury with Nathan Massey having to come off. Powell explained: “We lost Nathan Massey who had a bit of a problem with his clavicle. We’re not certain what that it is, we will have a better idea into next week.